The spring 2018 Interweave Knits is now arriving in stores and mailboxes, and I'm excited to share that I have a new sweater design in this issue. 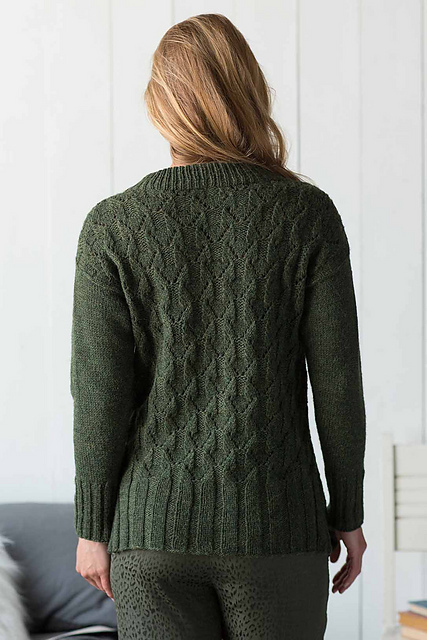 The Evergreen Mountain Pullover features striking sculptural and textural lace on the back and front, with patterning that’s easy to memorize and satisfying to knit. The body of this drop-shoulder pullover is worked from the bottom up in pieces and blocked before the neck and sleeves are worked in the round. The call for submissions for this issue asked designers what they'd most like to wear on a springtime retreat in the mountains. (Doesn't that sound nice? Wish I could go on one!) For me, the perfect sweater would have a casual, relaxed fit — a comfy pullover that's warm enough for chilly mornings when layered over a heavy T or a long-sleeve shirt — but also comfortable on warmer spring days when worn over something lighter, like a camisole. I do love to knit sweaters in the round, but for Evergreen Mountain I chose to knit the front and back separately. That’s because the stitch pattern really needs to be well blocked to open up and reveal its true beauty. I knew the blocking would be much more effective if the pieces were knit flat. After the sides are seamed, though, the sleeve stitches are picked up around the armholes and then the sleeves are knit in the round, downwards to the cuff. This sweater has one of my very favorite neckbands: a 1x1 rib that’s knit to double the intended length, then folded to the inside and sewn in place. It’s a little more knitting than just binding off in pattern, but I think the end result is well worth it. For this design, I didn’t use the same ribbing on the hem, sleeve cuffs, and neckband. Instead, they’re all different — the split hems have a wide rib that flows perfectly into the lace stitch of the body, while the sleeves have a 2x2 ribbing. I could have used the wide rib on the cuffs, but I felt it would have been out of proportion on that narrower circumference. Evergreen Mountain is knit in a worsted weight wool — Blue Sky Fibers Woolstok worsted. It was new to me, and I liked it quite a lot. It worked beautifully for the lace stitch and produced smooth and even stockinette on the sleeves. I would love to knit another sweater with it, especially with one of the natural (undyed) colors. If you'd like to cast on your own Evergreen Mountain, you can get the spring 2018 Interweave Knits online — or look for it at your LYS or local bookstore. Sweater weather is finally here! There's been a delicious crispness in the air in recent days, and I'm so excited to finally break out my hand-knit cowls, fingerless mitts, hats, shawls, and sweaters. As I type this, I'm wearing a brand-new sweater design, just released on Ravelry: the Mount Pollux pullover. 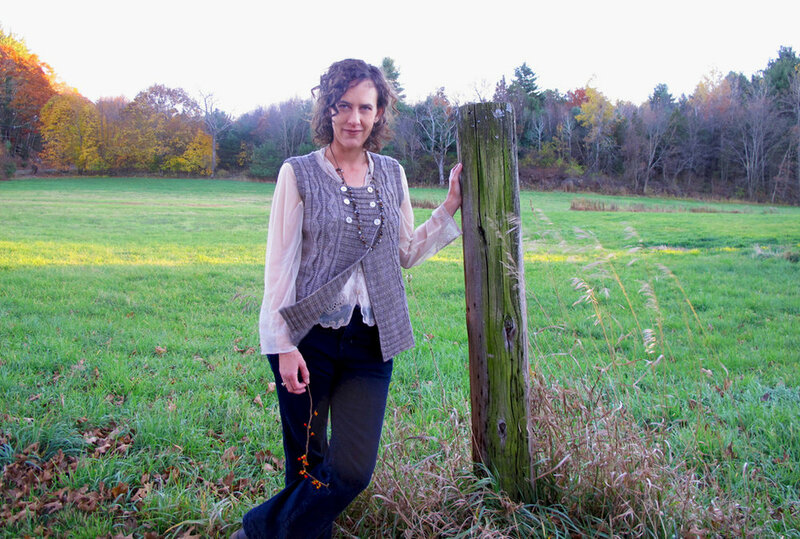 This roomy tunic-length pullover is named after the Mount Pollux Conservation Area in Amherst, Massachusetts, where the photos were taken. It's designed with a comfy, relaxed fit (shown here modeled with about 10 inches/25 cm positive ease). To celebrate its release, I'm having an introductory sale: through Sunday, November 19, save 25% on Mount Pollux in my Ravelry store with the coupon code MTPOLLUX25. Mount Pollux is worked mostly seamlessly. After the split hems are worked flat and joined on a circular needle, the body is worked in the round to the armholes. The upper front and back are worked separately and the shoulders are seamed. Stitches for the sleeves are picked up around the armholes and the sleeves are worked from the top down in the round. I love this method of knitting sleeves because you can try them on as you go to get exactly the length you prefer. Knit in worsted weight yarn, Mount Pollux features a satisfying mix of knit-purl textures, garter stitch, and lace. For the sample, I used Quince & Co. Owl, a wool/alpaca blend. This was my first time knitting with Owl, and I fell in love with its softness and lovely halo. It knitted up effortlessly into a sweater that's incredibly warm — perfect for chilly winter days ahead. I loved knitting this sweater — it was one of my favorite projects of 2017. And I love wearing it even more. I hope you enjoy it, too. Thanks very much for reading! 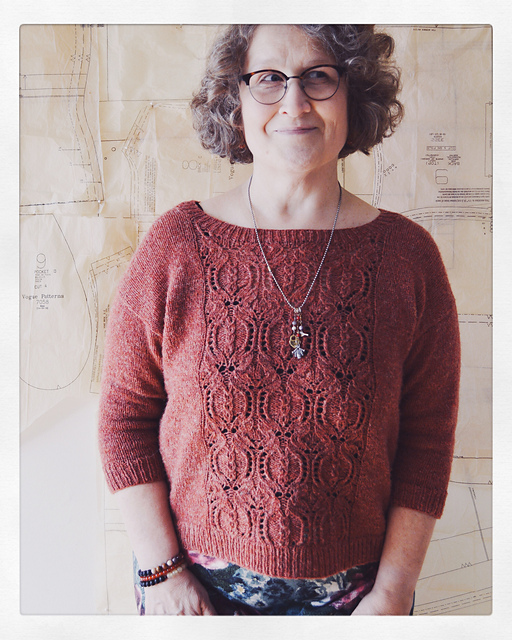 I'm excited to be putting finishing touches on the pattern for my Rhinebeck sweater! Just a few more photos to edit and final tweaks to the text and it will be ready. It's called Mount Pollux, after the conservation area in Amherst, Massachusetts, where I shot the photos. With this design, I'm bucking the "rule" that lace is for spring and summer. The sweater combines a lace stitch that's dense rather than open and airy with contrasting knit-purl textures and garter stitch accents. Worked in wool/alpaca worsted weight yarn (I used Quince & Co. Owl), Mount Pollux will keep you warm and cozy all winter. This sweater is meant to be worn with a good amount of positive ease, for a relaxed, oversized fit. On my sister Betsey, who modeled, the sweater had a lot of ease (about 10 inches). On me, it's more fitted yet still relaxed, with about 6 inches of ease — just the look I was hoping for. I look forward to releasing the pattern next week. If you don't already subscribe to my email list, now's a good time to sign up — there will be a special coupon code in the next one. The recent warm weather here in New England has been nice, but it also makes me a little nervous — is it global warming, or just an unusually warm fall? I hope these unseasonably high temperatures don't continue through the New York State Sheep and Wool Festival, coming up October 21-22. If it's hot, no one will want to wear their Rhinebeck sweaters or shawls! I'm so looking forward to Rhinebeck — seeing (and petting and hearing) lots of pretty sheep and goats. And — of course — checking out everybody's gorgeous knitwear. Maybe if all of us knitters wish for crisp, cool, and bright weather, we can make it happen. Let's try! I'm working like mad on my Rhinebeck sweater and am optimistic it will be finished in time. The pattern won't be published until November, but I can share a few details now: it's a casual women's pullover, with modified drop shoulders, knit in worsted weight yarn (I'm using Quince & Co. Owl, a wool/alpaca blend). It's worked in the round from the bottom up and the only seaming is at the shoulders (or, if you hate seaming, use a three-needle bind-off instead). More details soon! The other new design I'm working on is the third and final accessory for my Dragonfly Days collection (the first two were the Enallagma Shawl and the Cordulia Cowl). This time around, I've mixed in some cables with the dragonfly lace, to create a crescent-shaped shawl. Worked in bulky weight yarn — Brooklyn Tweed's Quarry — it will be super warm and cozy, perfect for chilly winter days. In other news: My Chili Pepper Cardigan from the fall 2017 Knitscene is now available as an instant download from Interweave. Did you know my patterns in the Interweave family of publications are available as digital downloads? I participate in the Designer's Choice program, which means my patterns appear both in the magazines and in the Interweave online store. It's a nice program both for knitters and designers — knitters can purchase individual patterns long after the print magazine is no longer on store shelves, and designers receive royalties for those digital sales. Are you going to Rhinebeck this year? If you're working on a Rhinebeck sweater, I hope it's going well and you finish with plenty of time to spare! It may be far too warm for wool sweaters right now, but that doesn't stop me thinking about them! The knitting part of my brain is already obsessed with fall. In fact, this week I cast on my Rhinebeck sweater. It's a new design — a pullover in worsted weight yarn (Quince & Co. Owl). More on that in the weeks ahead. With this post, I'm introducing a new feature on the blog — Throwback Thursdays. Every now and then, I'll post about an "oldie but goodie," to introduce newer followers of my designs to patterns they may not have seen yet (and maybe remind longtime followers about designs they forgot they had in their queues!). 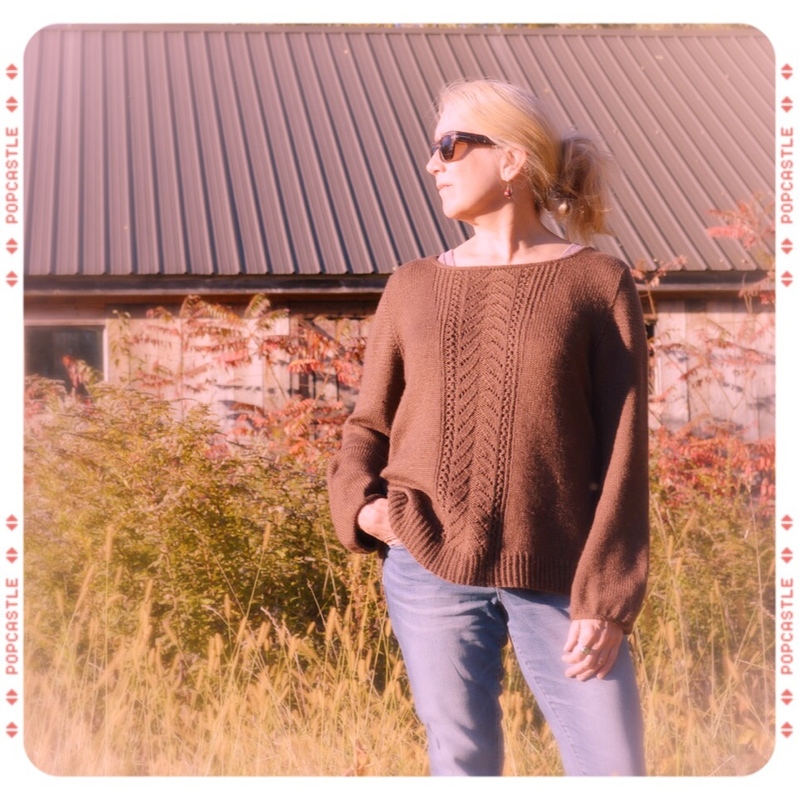 So let's start with one of my most popular sweater patterns, the Pomegranate Pullover. Knit in sportweight yarn (I used Quince & Co. Chickadee), Pomegranate features a wide lace panel on front and back, deep hip ribbing, and crisp twisted ribbing on the sleeves and neckband. It's worked in the round from the bottom up and there's not much seaming — just the shoulders — because the set-in sleeves are worked top down, using short rows to shape the sleeve caps. It's a versatile, classic pattern that looks terrific on many different figures. More than 170 knitters have posted finished Pomegranates on Ravelry, and it's really wonderful to see the wide range of colors and yarns they've used with great success. It's also nice to read how some knitters have made modifications to make this design truly their own. 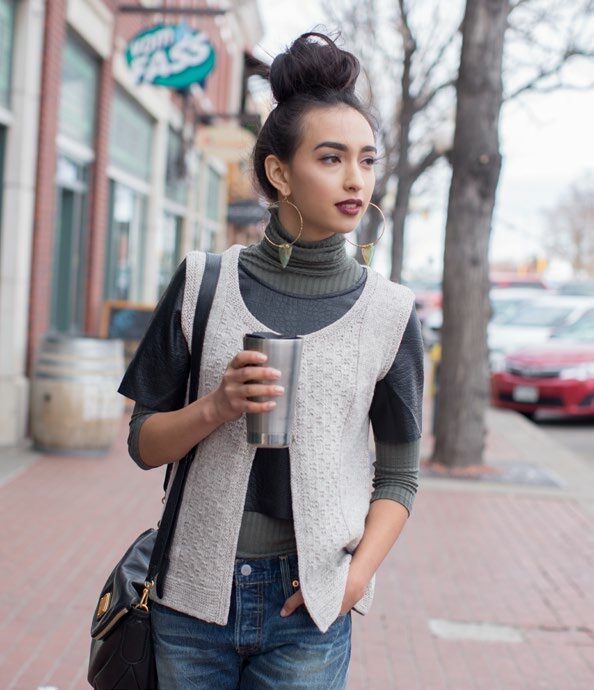 Some have knit long sleeves, some have converted it to a cardigan, others have skipped the lace on the back, and some have changed up the style of the neckband. Want to give Pomegranate a try? The pattern is on sale in my Ravelry store for 25% off today through Sunday, August 6, with the coupon code POM25. Happy fall knitting! The fall 2017 Knitscene is out! It's full of beautiful sweaters—including my Chili Pepper Cardigan. Chili Pepper is an open-front cardigan featuring a pretty lozenge stitch on its cuffs and fronts. It's a comfortable classic you'll wear for years to come—and it's equally at home in the office or on weekends. Knit in DK weight yarn (Valley Yarns Northfield, a soft merino/alpaca/silk blend), Chili Pepper is nearly seamless. It's worked in one piece to the armholes, then fronts and back are knit separately. After seaming the shoulders and back neck, the sleeves are worked top down, in the round. A touch of shaping gives the body a swingy, A-line shape. In addition to lots of great patterns, the fall Knitscene has an article on slipstitch colorwork, tips for getting a good fit, and an interview with Krysten Ritter. Find it at your favorite yarn shop or bookstore or purchase the digital issue directly from Interweave.